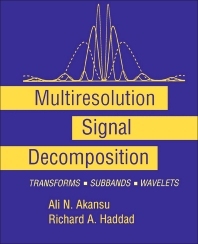 This book provides an in-depth, integrated, and up-to-date exposition of the topic of signal decomposition techniques. Application areas of these techniques include speech and image processing, machine vision, information engineering, High-Definition Television, and telecommunications. The book will serve as the major reference for those entering the field, instructors teaching some or all of the topics in an advanced graduate course and researchers needing to consult an authoritative source. Graduate students and researchers involved in signal analysis, coding, and compression. This includes industrial researchers as well as those in electrical engineering, computer science, math, and physics departments. Introduction. Orthogonal Transforms. Subband Signal Decomposition. Wavelet Transforms. Discussions and Future Research. Chapter References. Index. Richard A. Haddad received the B.E.E, M.E.E, and Ph.D. degrees in 1956, 1958, and 1962 respectively from the Polytechnic Institute of Brooklyn.He had been on the Electrical Engineering Faculty of Polytechnic University from 1961 to 1995. During his tenure there, he had served in variouscapacities. From 1981 to 1987, he was Associate Dean and then Director of the Westchester Graduate Center. During leaves of absence, he hasserved as a Member of the Technical Staff at Bell Telephone Laboratories, Whippany, N.J. and as first Director of the Engineering Division at theInstitut National d'Electricite et d'Electronique, Boumerdes, Algeria. He has also lectured and consulted in signal processing at universities in Italy,People's Republic of China. Presently he is Professor and Chair, Department of Electrical and Computer Engineering, New Jersey Institute of Technology. New Jersey.He is a senior memeber of IEEE and also an elected member of Eta Kappa Nu, Tau Beta Pi, and Sigma Xi, and the New York Academy of Sciences. Polytechnic University, Brooklyn, New York, U.S.A.
Ali N. Akansu received the BS degree from the Technical University of Istanbul, Turkey, in 1980, the MS and Ph.D degrees from the Polytechnic University, Brooklyn, New York in 1983 and 1987, respectively, all in Electrical Engineering. He has been with the Electrical & Computer Engineering Department of the New Jersey Institute of Technology since 1987. He was an academic visitor at David Sarnoff Research Center, at IBM T.J. Watson Research Center, and at GEC-Marconi Electronic Systems Corp. He was a Visiting Professor at Courant Institute of Mathematical Sciences of the New York University performed research on Quantitative Finance. He serves as a consultant to the industry. His current research and professional interests include theory of signals and transforms, financial engineering & electronic trading, and high performance DSP (FPGA & GPU computing).